Outline: God's call to man; His promises and love. I open the Bible. It is the Word of God. I open it at Isa. 45:22. I read what God said in His Word. He says, "Turn to me, all you who are at the corners of the world, for I am the only God. I alone can save you." Why does God tell us to turn to HIM? You know that when the world was created, Adam had not listened to God, the Word of God, but he listened to the word of the devil. Since that moment, men were cursed by him. God has left justice for the world. Men who sin will go to hell and suffer. God says that we all have to die some day, but after death it will not be the end. We will have to appear before the justice of God, and whosoever is not of God will be sent to Hell. But God is not as bad as we are thinking. He is good. He doesn't want to let us go to hell. He doesn't want us to suffer. That is why He has sent His Son, to die on the cross to shed His blood. The Bible tells us it is to cleanse us from our sins. 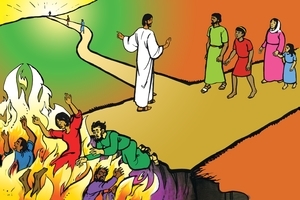 God says that whosoever believes in this, will not go to hell, but when he dies, he will go to Paradise. Jesus was nailed on the cross. He is risen. Before going to heaven, He said to the ones who were with Him, "Go into all the world and tell what has happened! Whosoever believes in Me, shall live. And whosoever does not believe in Me, and shall not be baptized, will see suffering and misery." But God says, "Whosoever believes, I will take him to Paradise." And God is even better, Not only does He want to give us Paradise, but He wants us to draw near to Him. He says, "All you that are heavy laden and tired, draw near to Me. I will give you rest. I will give you peace in your heart." God doesn't only want to call us to Paradise, but even on this earth He wants to help us. He wants to heal our sicknesses, our sufferings, our sorrows. He also says in the Bible, James 4:8, "Draw near to God and God will draw near to you." However, we have to accept from God, all these good things. We have to take the first step to God, and He will take a thousand steps towards you, because He loves us. He has given us another word. He said, "If you do what I told you, as long as you live, I will be among you." Now let us pray. "Holy God, we have announced Your word, which is written. We ask You to bless all those who have listened to Your word. Bless them in their lives. Give them strength and health. Give them to understand that You are alive among us. Thank you, God. Amen." GRN has recorded a version of this script in 109 languages and dialects. See full list.